Ryan Fitzpatrick threw eight touchdowns and one interception in his two games starting in place of the suspended Jameis Winston. Atop their quarterback depth chart, the Tampa Bay Buccaneers have a 24-year-old former No. 1 overall pick who won the Heisman Trophy and was handed the keys to the franchise just a couple of years ago. Behind him, they have a 35-year-old journeyman — playing on his seventh team — who is most notable for going to Harvard and having a massive beard. This is not a team that’s supposed to have a quarterback controversy in Week 3. But that’s the reality in Tampa right now. Ryan Fitzpatrick has led the Buccaneers to a surprising 2-0 record to start the season, including wins at New Orleans and against reigning Super Bowl champion Philadelphia. He has been nothing short of brilliant filling in for the suspended Jameis Winston, throwing for 819 yards, eight touchdowns and just one interception. With Winston set to return from suspension after Week 3, Bucs head coach Dirk Koetter won’t commit to either player as his starter. Meanwhile, wide receiver DeSean Jackson is on the record saying that Fitzpatrick should keep his job when Winston returns, arguing that the Bucs need to ride the hot hand. Fitzpatrick’s hand has certainly been hot to open the season. His 13.4 yards per attempt leads the NFL, as does his 15.3 adjusted yards per attempt, a stat that incorporates touchdowns and interceptions. It’s the most dominant two-game start to a season1 since 1972, when Joe Namath threw for 14.5 yards per attempt and 15.7 adjusted yards per attempt in two wins for the Jets. Koetter and the Buccaneers will be faced with a difficult political environment in the locker room if they choose to bench Fitzpatrick in favor of Winston after Jackson’s comments. But what do the numbers say? Should Tampa Bay ride the hot hand or sit Fitzmagic and hand the team back over to Winston? We’ll start by comparing career numbers — they provide the largest sample size and the least noise. Winston has a career yards per attempt of 7.5, well above the league average of 7.1,2 while Fitzpatrick is slightly below average at 6.8 yards per attempt. Both quarterbacks’ career touchdown rates are similar (4.5 percent for Winston vs. 4.4 percent for Fitzpatrick), as are their sack rates (5.8 percent for Winston vs. 5.4 percent for Fitzpatrick). 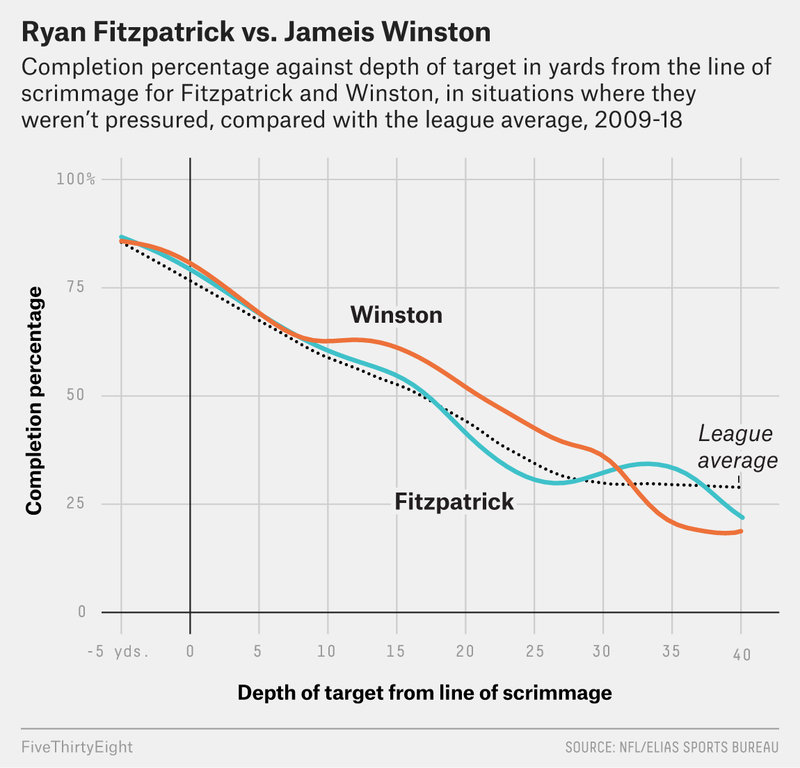 Winston appears to take better care of the ball than Fitzpatrick does (2.8 percent interception rate for Winston vs. 3.3 for Fitzpatrick), but interception rate is a notoriously noisy stat, so drawing firm conclusions about who is truly better is difficult. As a passer, Winston is worth almost twice as many points per play as Fitzpatrick is, and Winston is 4.2 percentage points more successful at keeping his team on the field with his arm. And while EPA per play from yards after the catch is negative for both players, Fitzpatrick has probably been helped more by his receivers than Winston has. In each of the first two games of the season, Tampa Bay offensive coordinator Todd Monken dialed up a deep pass attempt early. On the fourth offensive play of the game against New Orleans, Fitzpatrick threw the ball 38 yards in the air to DeSean Jackson, who then ran 20 yards after the catch for a touchdown. On the first offensive play of the game against the Eagles in Week 2, Fitzpatrick completed another long pass — 35 yards deep to Jackson, who then rumbled 40 yards after the catch, again for a TD. Those two plays account for two of Fitzpatrick’s eight touchdowns and 16 percent of his passing yardage on the year — and 45 percent of those yards were Jackson running after the catch. Apportioning credit for yards in football is notoriously difficult. If we plot Fitzpatrick’s career completion percentage by depth on plays in which he faced no pressure5 and compare it with both Jameis Winston and the league average, we can see that Fitzpatrick is actually quite good on deeper throws. We can also see that across most other depths of target, Winston is the superior passer, consistent with our previous metrics. Still, Monken has been smart with Fitzpatrick, calling deep plays early that take advantage of Fitzpatrick’s strengths, and it has paid off handsomely. Another area in which Fitzpatrick is superior to Winston is an unexpected one: QB scrambles. Despite being 10 years older, the journeyman completely outclasses the youngster when pulling the ball down and running. So while Winston is pretty clearly the better passer, there are legitimate reasons to prefer Fitzpatrick. The problem is that those reasons just aren’t terribly compelling. Having a 30-something QB — one who is not even known to be very fast — scramble for first downs is probably not going to be an integral part of the Tampa Bay game plan moving forward. Monken and Fitzpatrick have been great so far this season, but they’ve also been lucky. Passes that travel 25 or more yards downfield are worse than a 40 percent proposition across the league, and 95.7 percent of NFL passes go for less than 30 yards in the air. Optimizing for rare plays with a low probability of being caught probably isn’t wise. Finally, the way a quarterback plays in his first two games has almost no bearing on how he will perform over the rest of the season. (Sorry, Patrick Mahomes.) Using game-level passing data from Armchair Analysis from 2000 through 2017, I looked at how well a quarterback’s yards per attempt in the first two games of the season matched his rest-of-season numbers, and the first two games weren’t predictive.6 Basing your decisions on a two-game sample at the start of the year is deeply unwise, hot hand or not. The Buccaneers have one more week to evaluate Fitzpatrick’s play — and so will America, as Tampa takes on Pittsburgh in Monday Night Football. If Fitzpatrick has a poor game, it will likely make it easier for Koetter to decide to play Winston in Week 4. If Fitzpatrick has another solid game, there will likely be grousing in the locker room if he’s taken off the field, but it’s very likely the correct decision. Monken has shown the ability and creativity to maximize the talents of his players, and the Tampa Bay receiving weapons will be best served in the long run by having Winston under center. For a quarterback with at least 40 total attempts. The first year for which the data is available. Which typically means gaining at least 4 yards on first down, 4 on second down and 2 on third down. Work by Eric Eager has shown that QB performance from a clean pocket is more stable and predictive of future performance than when a QB is pressured.